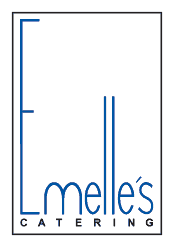 Our best experience with Emelle’s was just a couple years ago; we’d changed locations and we wanted to get existing clients into our new showroom, you know, to see the upgrades, to see our new equipment in the back and give them a tour of the new facility. There’s a lot of intimidating stuff involved in doing something like that but definitely one of the easiest parts, one of the smoothest was working with Nicole. She came up with a plan, we were able to talk about options for food and drinks, she was able to work something out that was within our budget; we were able to have beer and wine because they can arrange a license and it really added a level of polish to the event that I don’t think we would have been able to achieve on our own. People were asking me, “Who’s your caterer”. This is amazing, and there’s no better compliment than that. I think for Emelle’s folks were coming to my event and people wanted to use her for their events as well.